Art is on the move with less than a week to go before the Museum’s permanent gallery space dedicated to the long-term loan of the Keir Collection of Islamic Art opens on Tuesday, April 18. The largest public presentation of this renowned collection will feature works that range from rock crystal to metalwork, ceramics, textiles, carpets, and works on paper. Hi, I’m Taylor Strander, a senior from McKinney Boyd High School and a DMA Teen Advisory Council member. As the school year draws to a close and graduation looms near, I thought it was a perfect time to reflect on my busy year at the DMA! I have spent a great part of my school year exploring the DMA collection and collaborating with staff on a project for my ISM class. What is ISM? ISM stands for Interdisciplinary Study and Mentorship – a program specifically designed for high school students who have an idea of the career they want to explore beyond high school. The goal of the class is to develop interpersonal and networking skills in the hopes of obtaining a mentor that can offer their expertise in the creation of a final product. As someone interested in studying art history in college, I immediately sought to find a mentor who worked in a museum and was immersed in art every day. I distinctly remember growing quite fond of the DMA after my first visit with my elementary school class, and since then I have seized every opportunity to learn more about the Museum by participating in the Teen Docent Program and serving as a Community Engagement Volunteer. Due to my prior experience, I thought it would be most fitting to select a mentor from the place that catalyzed my passion for art. So I began my weekly commute to the DMA to meet and brainstorm with my mentors, Jessica Thompson and Whitney Sirois, on my final project for the class. Working with them has offered me a deeper understanding of the field of museum education and has strengthened my desire to pursue a career in a museum one day. My final project turned out to be something greater than I ever could have imagined and best of all, it is something that can be implemented in the Museum today. So, what did I create? In order to gain a better grasp on the role of a museum educator, I designed my very own Bite-Sized Tour and Art-to-Go Family Tote Bag complete with four different activities. 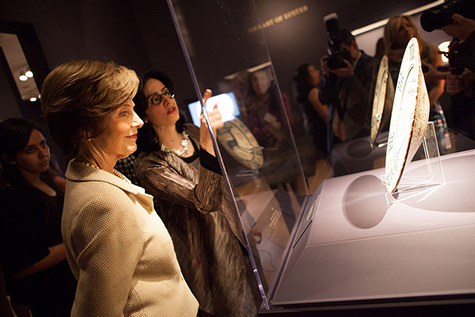 During my first meeting with Jessica and Whitney, I was inspired by the DMA’s exhibition Spirit and Matter: Masterpieces from the Keir Collection of Islamic Art, which features a variety of Islamic works from the internationally renowned Keir Collection. It was important to me to reference this collection for my project because Islamic art seems to be misunderstood and its influence on global cultures is often forgotten. 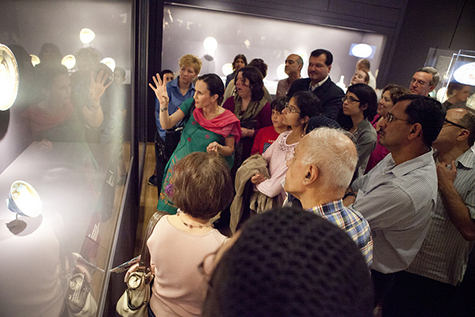 After some heavy research, I used my newfound knowledge of Islamic art to create a Bite-Sized Tour entitled “Cross-Cultural Connections.” This guide highlights Islamic works and directly compares them to other objects in the DMA’s permanent collection in an effort to encourage visitors to notice similar qualities or influences across cultures. The second component of my final project is an Art-to-Go Family Tote Bag, which is meant to reinforce visitors’ understanding of Islamic art through different activities that highlight specific artistic elements. Family Tote Bags are great because they offer fun, on-the-go activities for a variety of different age groups and learning styles. For the tote bag, I came up with four separate activities – write, make, draw, and talk. 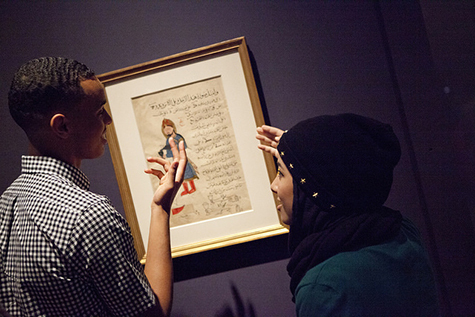 The writing activity asks visitors to reference Islamic calligraphy to create their own epic poem. 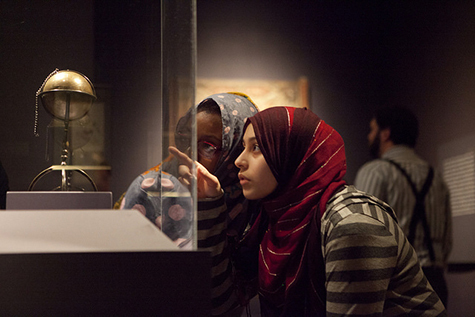 The make activity allows visitors to make their own astrolabe, a navigational tool that revolutionized Islamic culture. The drawing activity invites people to design their own geometric patterns inspired by Islamic textiles and ceramics. Finally, the talk activity encourages visitors to discuss Islamic art influences within the Museum’s permanent collection. 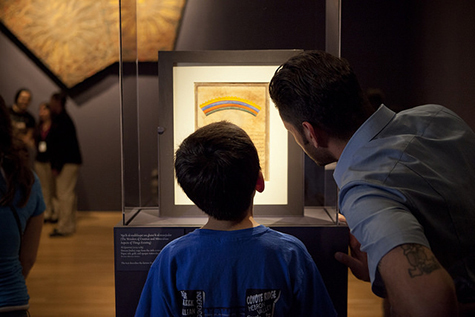 Islam’s holy month of Ramadan has just begun, so take a moment to explore the many connections you can make to this world religion and its artistic traditions on your next visit to the Museum. A special thank you to my mentors, Jessica and Whitney, for giving a young person like me an invaluable experience that I will carry with me for the rest of my life. Your words of wisdom and constant support will not be soon forgotten. And finally, thank you to the DMA for transforming before my eyes into a place that I know all too well, a place that feels like home. Tomorrow Spirit and Matter: Masterpieces from the Keir Collection of Islamic Art opens during our September fall block party Late Night. Huffington Post ranked it at #1 among “need to see” art shows this fall and it is a “Critic’s Pick” in The Dallas Morning News. This morning, exhibition curator and DMA Senior Advisor for Islamic Art Dr. Sabiha Al Khemir shared a sneak peek of the exhibition with national press. Be among the first to see these intricately decorated objects spanning numerous centuries and continents tomorrow night and join Dr. Al Khemir for a talk on the works of art at 7:00 p.m.
It’s the final week to visit the DMA-co-organized exhibition Nur: Light in Art and Science from the Islamic World, on view through Sunday, June 29. The acclaimed exhibition, which features more than 150 objects from ten centuries, highlights rare and beautiful examples of the rich heritage of the Islamic world and the influences and contributions it has made to cultures throughout history. This month’s recipe is inspired by our current exhibition Nur: Light in Art and Science from the Islamic World, which explores Islamic art and science throughout the centuries and around the world. Several beautifully decorated pieces of pottery can be found in the exhibition, including this striking bowl from Kashan, located in modern Iran. The Persian Empire spanned this area during ancient times and its cultural thread has continued, influencing food in the region today. In fact, Persians were one of the first to produce sugar and create recipes for cookies–some dating back to the 12th century–and sweets remain an important part of Persian celebrations today. Try this simple Persian recipe to add an interesting new flavor to your cookie repertoire and then be sure to stop by the Museum before Nur closes next month! Preheat oven to 250° F. Line rimmed baking sheet with parchment paper. In the bowl of a stand mixer fitted with paddle attachment, beat yolks and sugar at medium speed until light. Add rosewater if desired. In a separate bowl, stir together almond flour, cardamom, and baking powder. Slowly add almond mixture to mixer, stirring on low speed and scraping down sides of bowl until fully incorporated. Resulting dough should be slightly sticky. To form cookies, scoop off about a teaspoon of dough then roll between hands to shape into a ball. Flatten ball between palms and place on baking sheet. Bake about 25 minutes, watching closely to ensure cookies do not brown. When removed from oven, cookies will look very soft and should remain so at room temperature. Allow to cool on baking sheet then transfer to metal rack to cool completely. Recipe adapted from Food of Life: A Book of Ancient Persian and Modern Iranian Cooking and Ceremonies. This series of essays chronicles the historical periods of Islam, including the art that was produced during each. This resource provides background information about the art and culture of the Islamic world and teaching ideas for supporting studies of English language arts, math, science, social studies, world history, and visual arts. This informative documentary, narrated by Ben Kingsley, illustrates the entire history of Islam. The documentary is accessible via YouTube or available for purchase through Shop PBS. These lesson plans are designed for secondary social studies, civics, religion, and language arts classes to accompany the PBS Islam: Empire of Faith video and website. 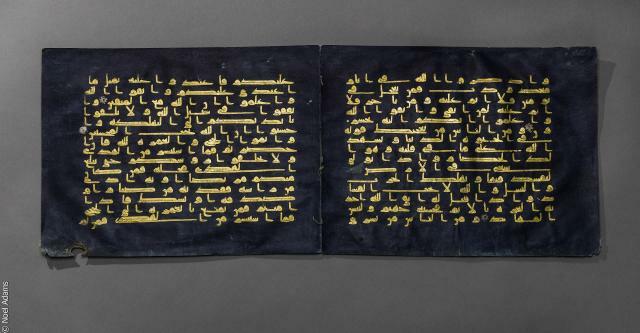 This online resource provides an historical overview of the periods of Islam, with examples of artwork from each period in LACMA’s collection. The resource includes great examples of contemporary Islamic art. 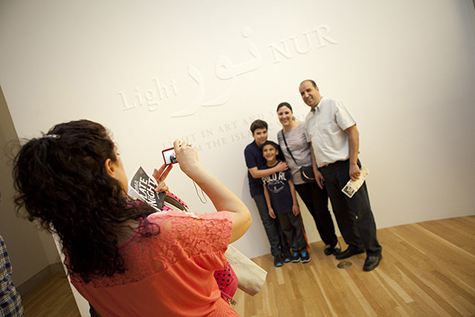 These teaching resources were created in conjunction with a 2013 exhibition at the Brigham Young University Museum of Art, curated by Sabiha Al Kemir, the curator of Nur. Read about several works of art in Nur: Light in Art and Science from the Islamic World.